Paul Phothyzan considers himself first and foremost an artist who’s created a substantial body of work since becoming interested in the arts in 1997. Some of the most startling results of his experimentation are now on view at the Singapore Art Museum. The exhibition in Singapore includes a “boat” he fashioned from the casing of a bomb dropped on Laos sometime during the war. 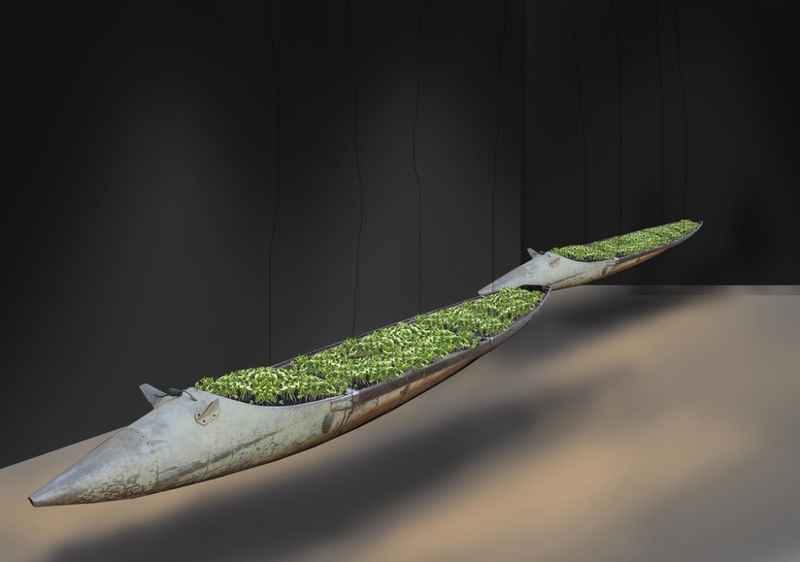 In this artwork, Lie of the Land metal bombshells have been repurposed as planters filled with ferns, making a powerful statement about the resilience of the human spirit and one’s ability to innovate in the face of obstacles. It also reflects the largely rural lifestyle in Laos. “The concept was that something meant to destroy could be put to good use – what was once dangerous instead benefits people in the form of a boat or a garden,” he says. Singapore Art Museum’s annual children’s exhibition Imaginarium explores human’s relationship with their environment. After last year’s ocean-themed show, this year’s Imaginarium edition heads To The Ends Of The Earth. Running from May 6 to Aug 27, the exhibition will include offerings ranging from colourful installations and film screenings to artist-run workshops. Its opening weekend, for instance, will feature live performances and a craft fair run entirely by children. More than 1,000 people attended the show’s opening earlier this month. The exhibition continues for four months, ample time to convey a sense of the work being produced by Lao artists. The show also features work by Japanese, Thai and Singaporean artists. Paul Phothyzan was “region’s most famous artist” by Channel News Asia along with Eko Nugroho Indonesian who features three of his deadpan surreal figures in a room filled with his trademark black and white loopy street art-meets-traditional Indonesian illustrations. Paul graduated from the National Institute of Fine Arts, Vietinane, Laos and has exhibited in group shows around Laos and at the Singapore Biennale. After Singapore, Paul’s pieces will return to Laos for a show at Vientiane’s Eastern Art Gallery, which he founded in 2015 to bring art to children and students who love drawing and painting but have no time in school to develop their skills. Hundreds of students have since visited the gallery on weekends, which has up to six teachers available at any given time. “During school vacations I hire some of the city’s art teachers to run classes at the gallery,” Paul says. Some come from the National Institute of Fine Arts, and others are freelance artists.